If you have a child, you’ve probably heard of the Magic Tree House series by Mary Pope Osborne. 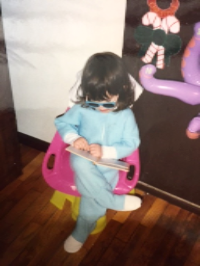 Believe it or not, I was reading these books back when I was little (you can see an effortlessly cool photo of me enjoying one of these books as a young reader above)., The series is now celebrating its 25th year! In recognition of this mega-cool anniversary, Kidsreads spoke to Mary Pope Osborne, (who reminds me of a real-life Ms. Frizzle from The Magic School Bus) about the Magic Tree House series, her favorite moments over the past 25 years and…drumroll, please…the upcoming movie inspired by the series! Click here to read our interview, and make sure to scroll down for our featured review and a link to all of the books in the series. We have found that once kids read one of these titles, they are always ready for more. One of the joys of series books is that new adventures can be found in each title, featuring the same characters. While Jack and Annie are old favorites, they’re not the only characters we’re excited to see more of this month. 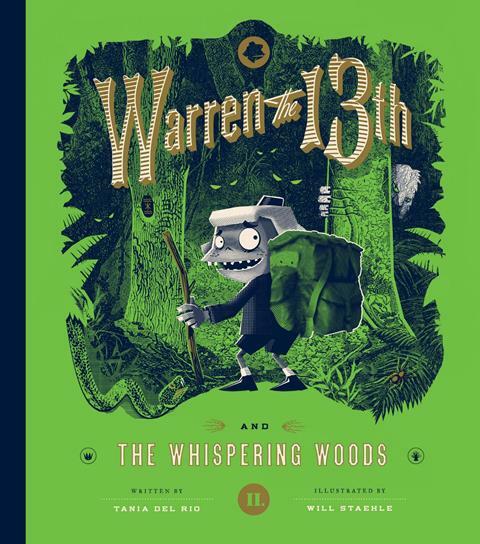 Tania Del Rio and Will Staehle’s Victorian bellhop Warren is also making his return with WARREN THE 13th AND THE WHISPERING WOODS. We first fell in love with Warren back in 2015 when he made his debut with WARREN THE 13th AND THE ALL-SEEING EYE. Now 12-year-old Warren --- and his walking hotel --- returns for a whole new adventure in the eerie Malwoods. In celebration of this new release Kidsreads.com's own Dana Cuadrado spoke with Tania and Will about the inspiration behind Warren, collaborating as a team and what we can expect from the next book in the series. Click here to read their answers, and scroll below to see our featured review and a link to the series feature. Of course, we're not the only ones celebrating March's newest releases. Earlier in this newsletter, I compared Mary Pope Osborne to Ms. Frizzle, arguably the coolest teacher in history. But can you imagine how you might feel if your own teacher was a published author? This is the reality for our Teenreads.com Teen Board member Alizé J., whose favorite teacher, Steven B. Frank, is the author of ARMSTRONG & CHARLIE, one of this month's featured reviews. 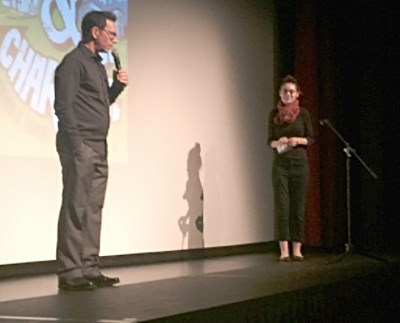 In addition to reviewing the book for us, Alizé had the opportunity to participate in a Q&A with Frank in front of her whole school. You can see a photo from the event above and be sure to check out our blog later this month to read Alizé's post about this event. Voting is now open for the Children's Choice Book Awards! This is the only national book award where kids decide who will win, so click here to vote on your favorite books of 2016 and scroll below to learn more about the awards. In Books on Screen news, Beauty and the Beast is the #1 movie at the box office this year, making readers young and old swoon nationwide. If you love Disney's animated version, you'll find yourself completely drooling over the live-action version (especially when it comes to Belle's library). Starting this Friday, you can catch Dreamworks' The Boss Baby in a theater near you. 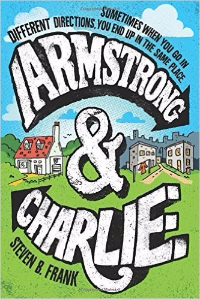 This laugh-out-loud story is told from the perspective of seven-year-old Tim, whose world has been rocked by the arrival of his new baby brother. Based on the picture book of the same name, this fun (and funny) movie is a perfect way to cap off your month. That's all for this update! As always, be sure to check out our series update below --- we've added new titles for a whopping 37 (!!) different book series this month. After 25 years of adventures with Jack and Annie in Mary Pope Osborne's Magic Tree House series, the fun still isn't over! For the series' 25th anniversary, Osborne has gifted her beloved readers with a special edition book for advanced readers. Set in France on the night before the D-Day invasion of World War II, WORLD AT WAR, 1944 follows Jack and Annie as they struggle to crack a code that could save many lives. While Osborne has spent the past several years researching and writing her Magic Tree House series, she has also become a huge advocate for children's literacy. Kidsreads recently had the chance to talk with Osborne about the past 25 years and the Magic Tree House series. In our exciting interview, Osborne discusses the process that goes into creating her educational stories, the future of the Magic Tree House, the importance of children's literacy and much more! 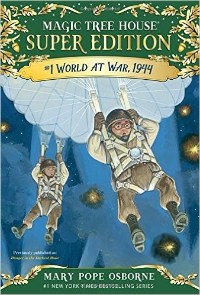 When the magic tree house takes Jack and Annie back to World War II, Europe is in trouble! It is June 1944 and the brother-and-sister team must go behind enemy lines and crack a code that could save a lot of lives. But this is war, and Jack and Annie might just be in the wrong place at the wrong time. Can they save everyone before the great battle of D-Day begins? They don’t know, but they have to try! Reviewed by Audrey Slater. Beginning in November 2015 with WARREN THE 13th AND THE ALL-SEEING EYE, Tania Del Rio and Will Staehle's whimsical children's series follows Warren, a Victorian bellhop who has taken over the management of his family's hotel. Full of wild and wacky guests, the hotel is home to dozens of adventures, puzzles and mysteries --- oh, and it walks. In celebration of the release of the second book in the series, WARREN THE 13th AND THE WHISPERING WOODS, we sat down with the incredible team behind Warren and asked them about their inspirations, collaborations and plans for future books. Twelve-year-old Warren has learned that his beloved hotel can walk, and now it’s ferrying guests around the countryside, transporting tourists to strange and foreign destinations. But when an unexpected detour brings everyone into the dark and sinister Malwoods, Warren finds himself separated from his hotel and his friends --- and racing after them on foot through a forest teeming with witches, snakes, talking trees, and mind-boggling riddles. Reviewed by Dana Cuadrado. 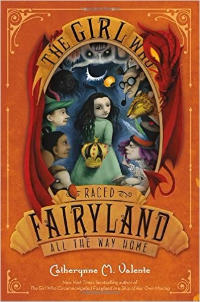 Vote in the Children's Choice Book Awards! It's time to vote for the Children's Choice Book Awards! It is the only national book awards program where kids choose the winners. From now until May 7th, you have the chance to share your opinion by casting your vote for the best book of 2016. Tell your teachers and librarians about this, too! Charlie isn’t looking forward to sixth grade. If he starts sixth grade, chances are he’ll finish it. And when he does, he’ll grow older than the brother he recently lost. Armstrong isn’t looking forward to sixth grade, either. When his parents sign him up for Opportunity Busing to a white school in the Hollywood Hills, all he wants to know is "What time in the morning will my alarm clock have the opportunity to ring?" When these two land at the same desk, it's the Rules Boy next to the Rebel, a boy who lost a brother elbow-to-elbow with a boy who longs for one. Reviewed by Alizé J., Teen Board Member. A young mermaid, called Fish Girl, in a boardwalk aquarium has a chance encounter with an ordinary girl. Their growing friendship inspires Fish Girl's longing for freedom, independence, and a life beyond the aquarium tank. 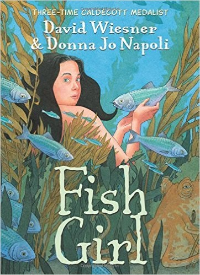 Sparkling with humor and brilliantly visualized, Fish Girl's story will resonate with every young person facing the challenges and rewards of growing up. Reviewed by Audrey Slater. Whether it is basketball dreams, family fiascos, first crushes, or new neighborhoods, this bold anthology --- written by the best children’s authors --- celebrates the uniqueness and universality in all of us. 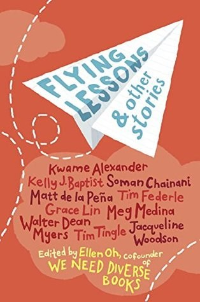 In a partnership with We Need Diverse Books, industry giants Kwame Alexander, Soman Chainani, Matt de la Peña, Tim Federle, Grace Lin, Meg Medina, Walter Dean Myers, Tim Tingle and Jacqueline Woodson join newcomer Kelly J. Baptist in a story collection that is as humorous as it is heartfelt. Reviewed by Reanna H., Teen Board Member. Tess and her brother, Max, are sent for the summer to their aunt’s sleepy village in the English countryside, where excitement is as rare as a good wifi signal. So when Tess stumbles upon an old brass key that unlocks an ornately carved gate, attached to a strangely invisible wall, she jumps at the chance for adventure. And the world beyond the gate doesn’t disappoint. She finds rose gardens, a maze made of hedges and a boy named William who is just as lonely as she is. But at William’s castle, strange things begin to happen. 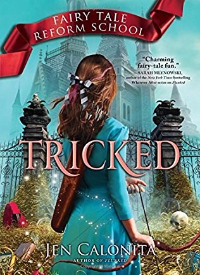 In a magical, fantasy world that blurs the line between reality and imagination, readers are left to wonder exactly what they’d wish for if wishes could come true. Reviewed by Alyssa Cami. Blue is an orphan who disguises herself as a newsboy. There's a war going on, and girls are expected to help the struggling economy by selling cookies. But Blue loves living and working at the Bugle, the only paper in town that tells the truth. And what's printed in the newspapers now matters more than ever. But Blue struggles with her secret, and worries that if her friends and adopted family at the Bugle find out that she's a girl, she'll lose everything and everyone she cares about. Reviewed by Aimee Rogers. Even Truly Lovejoy has to admit that teeny-tiny Pumpkin Falls, New Hampshire, has its charms --- like the annual maple festival, where tourists flock from all over to sample the local maple syrup, maple candy, maple coffee and even maple soap! But when someone tries to sabotage the maple trees on her friend Franklin’s family farm, Truly has to rally the Pumpkin Falls Private Eyes to investigate. Meanwhile, she uncovers another, more personal mystery under the floorboards of her very own home --- a diary written centuries ago by her namesake, the original Truly Lovejoy. 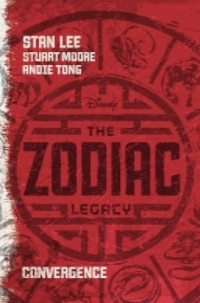 Reviewed by Matthew Burbridge. Jean-Michael Basquiat and his unique, collage-style paintings rocked to fame in the 1980s as a cultural phenomenon unlike anything the art work had ever seen. But before that, he was a little boy who saw art in poetry books and museums, in games and in the words that we speak, and in the energy of New York City. Now, award-winning illustrator Javaka Steptoe's vivid text and bold artwork young readers to the powerful message and art doesn't always have to be neat or clean to be beautiful. Reviewed by Jesse Kornbluth for HeadButler.com. Here is the story of extraordinary leader Alice Paul, from the woman suffrage movement --- the long struggle for votes for women --- to the “second wave,” when women demanded full equality with men. Reviewed by Anita Lock and Sally Tibbetts.